This is the illustrated story of my southern motorcycle excursion in the summer of 2005. Outbound, I followed Old US Route 66 from Joliet, IL, to Clinton, OK. Inbound, I followed the Natchez Trace Parkway from Natchez, MS, to Nashville, TN. I covered 3871.4 mi and bought slightly over 100 gal of fuel, not counting the carburetor cleaner that I poured in the gas tank. Total cost was about $225. Highest price was $2.489 at Saukville, WI, the last stop. Lowest price was $2.139 at Franklin, OH, the third from the last stop. 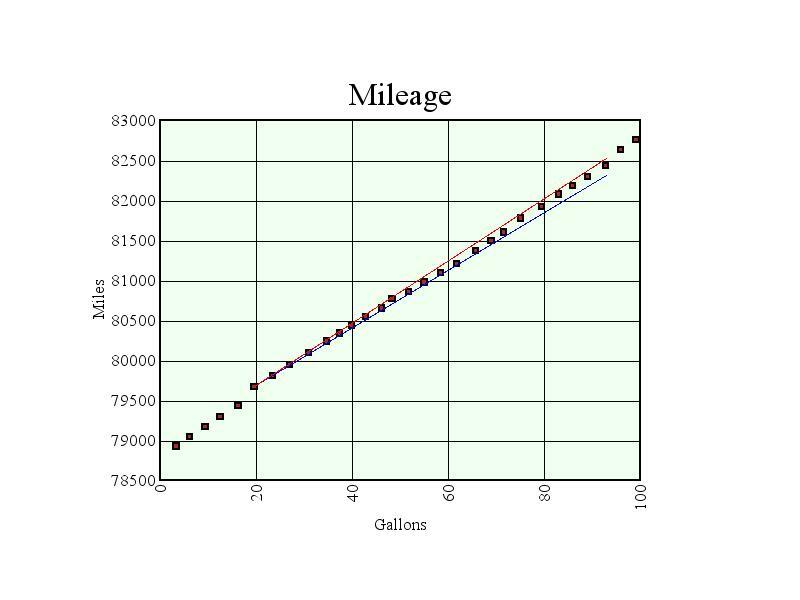 Mileage was between 36 mpg (the blue line on the graph) and 39 mpg (the red line), not counting the two times I neglected to record a fuel purchase. I-55 in IL, I-44 in MO and OK, and I-40 in OK.
My goal was to attend a realtime gettogether of more or less virtual friends and motorcycle enthusiasts who correspond via the online discussion group rec.motorcycles. For a year, a pair of T-shirts had circulated through Canada, the continental US, and Hawaii, collecting signatures by participants at local gettogethers. These had recently returned to their starting point in Breckenridge, TX. We were to congregate there to admire the finished product. The Natchez Trace Federal Parkway in MS, AL, and TN. Rhode, Chuck. "Old US Route 66 and the Natchez Trace." The Mother Road and the Natchez Trace. 4 Aug. 2005. Lacus Veris. 24 Apr. 2019 <http://lacusveris.com/MotherRoad/index.shtml>. Last modified 6 Oct. 2015. Served 21325 times between 16 May. 2010 and 24 Apr. 2019. Contact mailto:CRhode@LacusVeris.com?subject=LacusVeris.